Decorating for Easter is so fun—who can resist all the cute bunnies and pretty pastels. 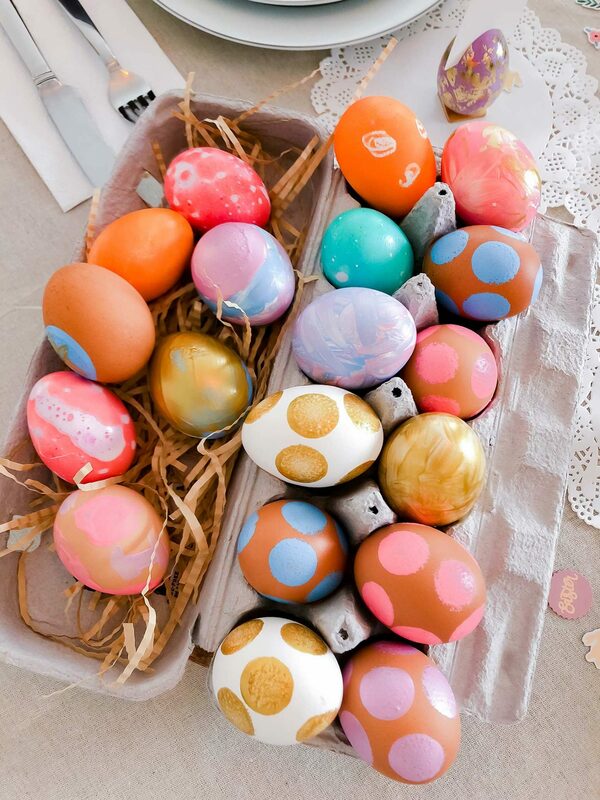 Alexandra and I decorated the eggs pictured above last Easter and we had a blast. We used dye to make the marbled ones and acrylic paint and foam daubers for the polka dots. I’m also looking for an Easter dress for Alexandra and usually wait for some kind of friends and family promo to pop up—will keep you posted. I bought these Alessandra Rich earrings recently and I absolutely love them! They are so major (they are quite large but very comfortable to wear thanks to a sturdy clip that doesn’t pinch). My husband was taken aback because I’m not much of a jewelry person but these just really caught my eye and now I’m on the hunt for more over-the-top accessories like these. I’m also into belts at the moment and love all of the ones below. Spring is the time to refresh your beauty drawer, right? I have been using Charlotte Tilbury almost exclusively since I had my makeup done by them and I love the pretty pink and coral lip glosses for spring. I also like the Tom Ford Lumiere lipstick, which works with your body chemistry to create a custom shade, and a couple of the Nars eyeshadow palettes for spring. I don’t use a lot of things on my face but I always have the CAUDALÍE gentle buffing cream in the shower. It makes my skin feel so clean after hot yoga. For spring, I plan to try the toner and cleansing milk. Keep in mind that you can use the code NETAPORTER15 to get 15 percent off a bunch of items from Net-A-Porter through March 31. We bought the most amazing sectional sofa for our new family room (it’s memory foam!) and I love to keep comfy quilts on it. These ones from H&M are perfect for spring. I have also been slowly going through my pantry and using these OXO pop airtight containers for more items. Honestly, I used to think these were kind of silly but I have to say they are giving me great joy—they really do make your kitchen feel prettier and calmer.